The Big Island is a haven of cultural and ethnic diversity. The many immigrants that once made the move to Hawaii each contributed something to the local cuisine. This means that the Big Island has a very interesting and unique food scene! If you are (even slightly) adventurous when it comes to food, you are bound to have a good time sampling all the local specialties of Hawaii. With “local food” we mean both locally grown and/or produced foods that are also well known outside of the Hawaiian islands, such as coffee, chocolate, and beer, as well as the “truly” local food whose recipes are unique to Hawai’i. You might think that pineapples are the token Hawaiian fruit, but they actually originate from Brazil! Locals consider them an export product rather than part of their culture (more pineapple facts!). You can of course also sample all the locally grown food at many farmers markets across the Big Island. Hawaii’s tropical climate allows for the production of many exotic crops that you cannot find anywhere else in the Unites States. Hawaii is the only state where coffee is commercially produced, which has led to the world famous Kona coffee and the just as tasty but less well-known coffees from the Ka’u, Puna and Hamakua districts. Chocolate is another of the exotic crops that is grown on the Big Island. The cacao is farmed organically on the rich volcanic soil, and afterward locally processed and sold on Hawaii. Hawaiian macadamia nuts are the healthier local product. These nuts are among the most healthy of the world and are connected to e.g. lower cholesterol levels. After indulging in these treasures, you can finish your day with a local beer. There are (micro)breweries in Waimea (the Big Island Brewhaus), Kona (the Kona Brewing Company) and Hilo (the Mehana Brewing Company). Their beers are sold in bars and supermarkets all over the Big Island. There are many snacks that are typically Hawaiian other than the “Big 4” listed above. Some of these snacks were already consumed by the traditional Hawaiian population. Others are the result of the unique ethnic melting pot that has become current-day Hawai’i. If you happen to see any of these snacks during your vacation on the Big Island, we heartily recommend having a bite! Is raw fish marinated typically with soy sauce, onions and lemon (but many other marinades also exist). It has become more popular worldwide because of the rise to popularity of the “Poke Bowl” but is very typical to Hawaii and, honestly, tastes the BEST here on the islands :D.
You can find poke in most restaurants but also in the supermarkets. The local KTA supermarket, for example, is a good place to pick up some poke. Other good places to get poke are the Suisan Fish Market in Hilo and Umeke in Kona. You can find spam musubi in local supermarkets, gas stations, the L&L Hawaiian BBQ chain restaurants, and perhaps even in a restaurant or two. Is a traditional Hawaiian “pudding” made from the taro root that was a main source of carbohydrate for the native Hawaiians. Poi is typically served at a Luau but you can also buy it at local supermarkets like KTA. Is a fresh tomato and salmon salad and is a traditional side dish served at Hawaiian Luaus. You can also find it at local supermarkets and restaurants and sometimes at fish markets such as Suisan in Hilo (see their facebook post). Consists of fish and pork wrapped in taro and ti leaves and smoked in an underground emu oven. Delicious but cumbersome to make yourself. Available at local restaurants and supermarkets such as KTA. Kālua is a traditional Hawaiian cooking method that utilizes an emu, or underground oven. The word kālua literally means “to cook in an underground oven” and also describes the flavor of food cooked in this manner. Kalua pig is traditionally served at Hawaiian Luaus but is omnipresent on the island as part of breakfast, plate lunch (e.g. at L&L) or at a buffet. Is a traditional Hawaiian dessert made from coconut milk and cornstarch. Available in most supermarkets and restaurants. is a favorite local style dish with steamed rice, a hamburger patty, fried egg and brown gravy. Guaranteed to get you through the day! You can get this almost everywhere on the island but we’d like to distinguish Cafe 100 in Hilo and the Tex drive-in in Honoka’a for extra taste loco moco’s! (small Japanese rice cakes) are now a very popular snack in Hawaii. For one of the best tastes of the Island, go to Two Ladies Kitchen in Hilo and ask for the Strawberry Mochi! Huli means ‘to turn’ in the Hawaiian language, and it is a great description of these chickens. They are roasted golden brown over a grill while they are continuously turned. We like to get our chickens at the farmers market. are Portuguese sugared and fried balls of fluffy yeast dough. 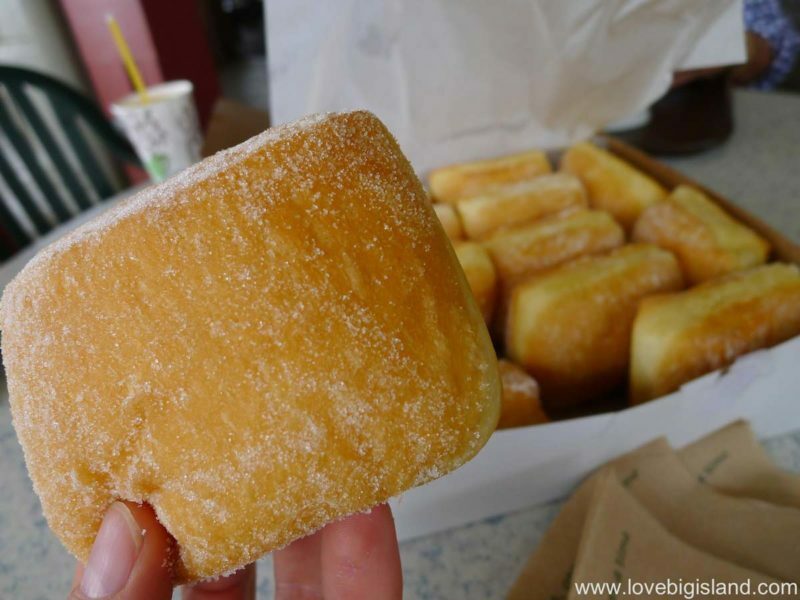 Tex Drive Inn in Hanoka’a serves (according to us) the best malasadas on the Big Island, with a close second place for the Punalu’u bake shop. Malasadas (or malassadas) are Portuguese sugared and fried balls of fluffy yeast dough. They are bad for you but SO tasty!